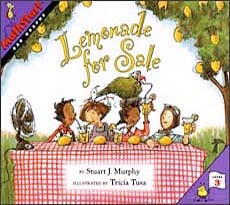 In this MathStart series book, four friends start a lemonade business and use graphs to chart their growing sales. Sales are improving until a boy down the street starts a juggling act for money. How will that impact their sales? The friends use a variety of graphs to answer that question. Children enjoy making graphs but some have a hard time grasping the WHY of the activity. They focus on the 'picture' itself and miss how the picture is a tool to help people understand data better. This book tackles that problem-- clearly showing how the kids in the story used graphs to help them understand how their stand was performing over time. Kirkus called it "a winning way to make some basic concepts and techniques less intimidating." We totally agree! Below are two spreads from inside this cute graphing book. To see larger versions, just click on the pictures. You can see that graphing is integrated into the storyline right from the start. That's the second spread with the graph in it.